Amazon rose to an all-time high, along with Facebook and Microsoft, lifting the broad S&P 500 index. Friday marked the first time since Feb. 1 the S&P 500 closed above 2,800. "2,800 has been a significant level both mentally and technically for the market," said Jeff Kilburg, CEO of KKM Financial. "I think this will be a short-lived move above 2,800, however" as trade concerns and corporate earnings releases keep gains at bay. The Dow Jones Industrial Average rose 94.52 points to 25,019.41 with United Technologies and Walgreens Boots Alliance outperforming. The Dow also closed above 25,000 for the first time since June 15. The Nasdaq Composite eked out a small gain to close at 7,825.98, a record. Some of the major U.S. banks reported earnings Friday before the open. J.P. Morgan Chase posted better-than-expected earnings and sales, as its trading revenue rose 13 percent in the second quarter on a year-over-year basis. Citigroup, meanwhile, posted a stronger-than-expected profit but its revenue for the quarter missed. J.P. Morgan Chase slipped 0.5 percent after rising as much as 0.9 percent, while Citigroup dropped more than 2 percent. Wells Fargo’s earnings and revenue both missed as its fake-account scandal is still taking a toll on the company. The bank also said a tax hit of $481 million also pressured the results. Shares of Wells Fargo fell 1.2 percent. Just over 5 percent of S&P 500 companies have reported second-quarter results thus far. These companies have posted earnings growth of 16.37 percent. However, analysts polled by FactSet expect second-quarter earnings to have grown by 20 percent. Stocks posted strong weekly gains, with the Dow, S&P 500 and Nasdaq all rising more than 1.5 percent. 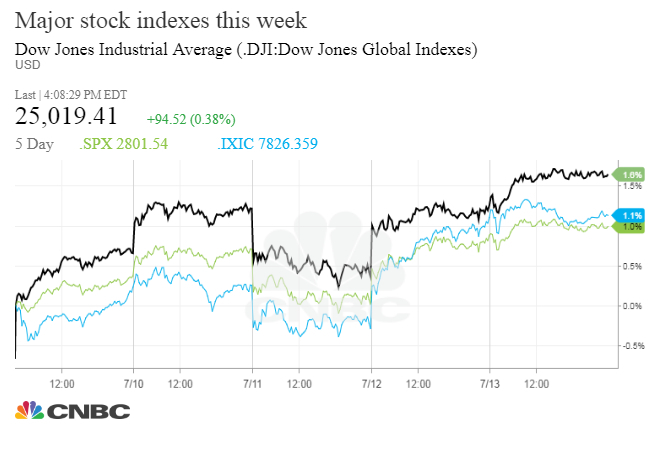 The major indexes have risen as concerns over a trade war between the U.S. and China have eased. Earlier this week, the U.S. unveiled tariffs on $200 billion worth of Chinese goods. However, a lack of response from China to these levies has assuaged some fears of conflict escalation. "Investors are looking past a lot of the global headlines and into the earnings reports," said Jack Ablin, founding partner of Cresset Wealth.